Michigan Street Animal Hospital, is known for offering low cost veterinarian services in Orlando. Regular customers get discounts for annual shots and discounted rates on almost all regular check ups, vaccinations and surgeries. Among the services offered are declawing, dentistry, canine and feline vaccination, spaying and neutering as well as specific surgeries. Speak to any of Michigan Street Animal Hospital customers and they’ll tell you that their pets are in good hands with us. Our ultimate goal is to provide the best care to your animals before, during, and after any procedure or surgery. 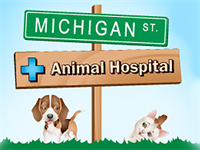 Visit Dr. Mansour at Michigan Street Animal Hospital. Dr.Mansour is one of the finest people I have ever known. He genuinely loves his animal patients and he respects the great bond that most of us have for our pets. I always have too many animals, and he always takes great care of them. In the last 25+ years, he has given me two miracles.